More and more wedding couples are trying to look for something new. Something that has not been used on other weddings before. Something unique. This will make their wedding day really something to remember. And the new thing wedding couples are turning too right now is Wedding Doughnut. Yes, you heard it right. Doughnuts. This new offer is being brought by Krispy Kreme. And it is already hitting the capital like a plague. 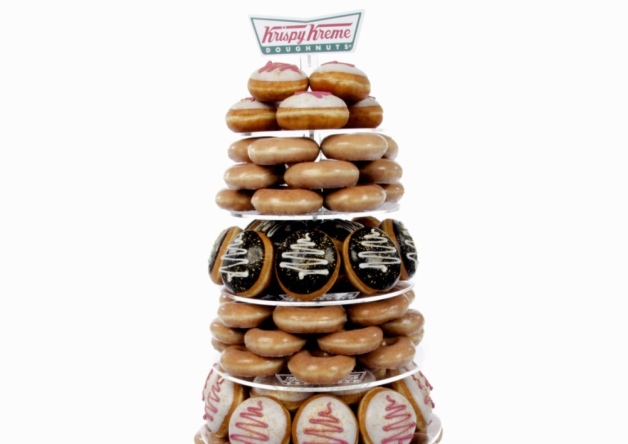 Krispy Kreme has launched a range of wedding towers to let fans mark the big day with their favourite treats. And the eight-tier extravaganzas are already proving a hit in the Capital with ­couples rushing to book. 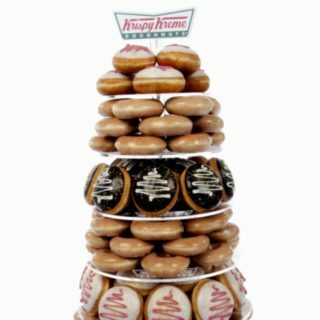 Traditionalists can plump for the original tower – with 183 glazed doughnuts – that can be easily elaborated with flowers or wedding colours. Or those looking for a more extravagant cake can pick their favourite flavours for half the levels, with the sugar rings completing the set. Roni Hyslop, who runs Edinburgh-based wedding planners All Wrapped Up, said the craze highlighted the move away from traditional weddings. She said: “I think there is so much to choose from ­nowadays. We ourselves offer eight ­different flavours of cake including lemon drizzle cake and jaffa cake. The popular outlet sold nearly five million of the sugary snacks in its first six months after opening in February, and in addition to speciality doughnut cakes has also started selling festive mince pie doughnuts to customers. Prices of the wedding ­towers start at £280, considerably cheaper than customers would expect to pay for a three-tier iced fruit cake version. 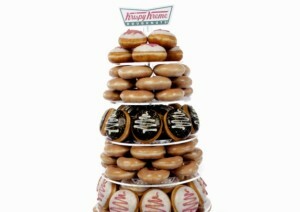 Judith Denby, chief marketing officer at Krispy Kreme UK, said the towers could be enjoyed at any event. As among other things, weddings also evolved as it can be made more flexible and reflecting the personality of the persons going to get married. 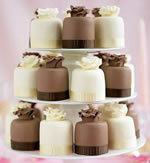 With that, wedding cakes also evolved from the traditional 2-3 layer fruit or cheese cake. Gone are the times that we also simply choose a regular chocolate cake. Some of us now preferred to choose combination of cheeses arranged in a tower adorned by pieces related to the motif of the theme. Some of us also choose a tower of cupcakes instead of a cake topped by one layered cake. The cupcakes usually served as giveaways for the guest. Some still preferred the traditional layer cake but just added with a twist. We have listed below some unusual but very elegant looking and pretty cakes available in the market. 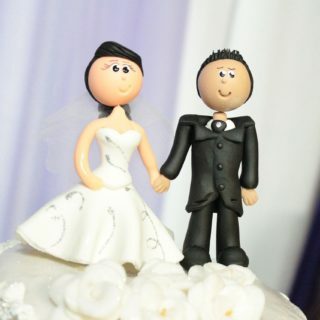 Handmade, personalised wedding cake toppers, where to buy them and what’s involved? The tradition of the wedding cake topper dates back many years, but the trend to personalise them is fairly recent. Now for around £80 you can have a unique and memorable souvenir of your most special day that you can keep and treasure forever. 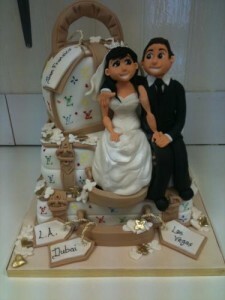 Some couples still choose to adorn their cake with the traditional Bride and Groom Figurines. Although many are now opting for something more original and unique to themselves. There are now quite a few people engaged in creating these little fellows but where are you likely to get the most satisfying result? Once you’ve found a designer that you like, you need to send them a photo of the marrying couple together with any other information such as your occupations, hobbies, theme and so on. This will help your designer to create a cake topper which is unique to you. You need to do this well in advance of your planned wedding day – especially at peak times between the months of March and September. Once you have agreed the look of your topper, it will be scheduled into the designers’ diary for completion a few weeks before your wedding day. You will then be sent a photo of your completed topper before it is despatched. One of the original producers of personalised cake toppers, Helen at GooglyGifts has been selling toppers on-line for many years and her work has even been featured on TV shows You are What You Eat and The Jeremy Kyle Show. Toppers can be ordered in a variety of styles and poses – each personalised using a photo and from details submitted via a simple questionnaire; with extras including props, children and pets available upon request. Helen has recently re-launched her site, having taken time-out to live abroad, and is looking forward to producing some more customised wedding cake toppers. Helen is also planning to offer more personalised products and will be adding these to the range later in the year .. see the site for more details. One such range is her Indian wedding cake toppers which has its own site too. Artlocke Designs is run by Cheryl Locke. Cheryl has been making toppers for quite a while and is an artist who is often recommended and always busy. Sarah Pitcher from Character Creations says “I have been making these toppers since Jan 2006 and never realised there would be such a demand for them. I would like to think the figurines keep improving, as with any new venture you learn as you go along”. “The demand is finally dropping after a very busy summer season. I am now getting orders for next year and would recommend that couples wanting a cake topper to book in as soon as possible so they have a space and then send their details and photos at a later date”. On a personal note, Sarah says “Making the toppers from home and being my own boss is very rewarding. People really appreciate the time and effort that goes into making the toppers and the best thing of all is getting feedback from happy customers when they receive their little look-alike people”. Weston Super Models is the creation of Sue Weston. Sue has been making models in one form or another since she was six years old. After studying for an HND in Art, Sue started experimenting with Fimo clay by making life-like figures. She was soon being asked to make models for other people. Things progressed from there… and after selling her characters successfully on eBay, Sue progressed to running her own website and she now produces unique toppers for couples throughout the UK as well as Australia and the US. Sue has recently ventured into making celebrity look-a-like figures in order to enhance her product range and has recently completed a figure of Amy Winehouse. 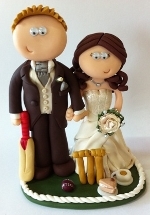 The Icing On Top – Handmade and personalised cake toppers for your wedding day or any special occasion. 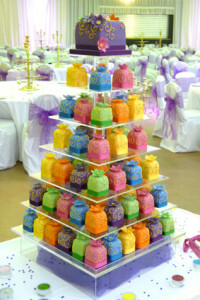 Wedding Treasures – a good range of toppers with a variety of themes. 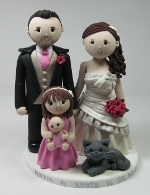 These personalised cake toppers are made from Fimo Polymer Clay – hand made from scratch so no moulds are used. Once fired in the oven they turn into a hard plastic material which is non toxic and everlasting! This would make a lovely keepsake after your wedding day. You can have your wedding topper in any pose. For example – sitting, dancing, holding hands, etc. The finished toppers can resemble clothing, flowers and hairstyles, and you can include extra figures, pets, etc for a small extra cost. The creative process takes anywhere from two days to craft a bride and groom to a week to include extra figures. The wedding cake is one of the oldest wedding traditions. The custom dates back to the ancient Greeks who served pies made of sesame seeds and the Romans who shared small wheat cakes at their weddings. 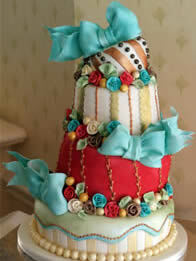 Cakes containing grains such as wheat, seeds, fruit and nuts are thought to symbolise fertility. While the bride and her dress play are, quite rightly, the centre of attention at the wedding, the wedding cake should take centre-stage at the reception. An interesting fact is that the wedding cake is often the second most photographed subject at a the average wedding! Today’s contemporary wedding cakes can be as modern or traditional as you want them to be and choosing the wedding cake is one of the really fun parts of organising your wedding. 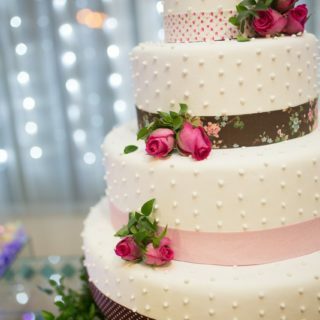 The way your wedding cake tastes is just as important as the way it looks, so when making an appointment with a cake supplier make it clear that you would like to sample the cakes. Fruit cake will always be a popular choice, especially with more traditional guests? A clever way of catering for everyone’s tastes, if you’re having a tiered wedding cake, is to have each tier with a different filling. Consider whether any of your guests have any food allergies or intolerance? Gluten intolerance and nut allergies are the most common and can easily be worked around by asking your wedding cake supplier to make one gluten or nut free tier. The size of the cake will determine the basic price and then the work on the cake, sugar flowers, intricate decoration etc, will determine the final price. 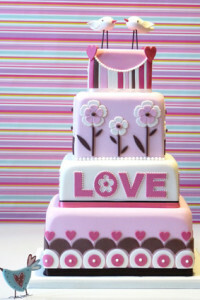 If you are working to a budget, the rule is: the simpler the cake, the less expensive it will be. One way to keep the cost down is to choose a sponge cake rather than the traditional fruitcake, or perhaps have one sponge cake tier and the other fruitcake? Not only will you be cutting costs, you’ll also be able to please fussy guests. While the traditional style wedding cake remains popular, there are plenty of others to choose from. The contemporary version of a traditional wedding cake might feature coloured icing and detailed sugar decoration to fit the colour scheme and style of the wedding. 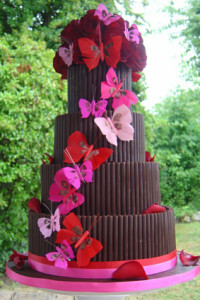 Nowadays, there are wonderful alternatives to the tiered wedding cake. 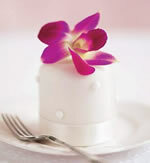 A fairy cake wedding cake is increasingly popular and means that you can give each guest their own individual cake. You might even decide to ice names on each cake and use them as place cards! Whichever cake you choose, help your cake maker by taking along any pictures of cakes you like, as well as colour swatches of your wedding outfits if you want a matching colour scheme. 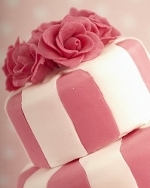 As with most suppliers, the best way to find the perfect wedding cake maker is by personal recommendation. Failing this, you can visit wedding fairs and exhibitions in your area where wedding cake designers show examples of their wedding cake designs. It’s important to see photographs of their other work, and to have a taste – a cake that looks fantastic may not necessarily taste as good as it looks! 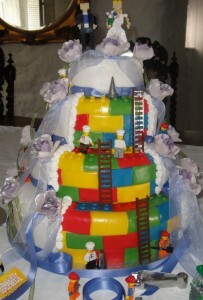 On your wedding day, make sure the wedding cake can be seen by all your guests. The wedding cake can be a real focal point of a room so it shouldn’t be hidden away in a corner. Traditionally the cake should be on display throughout the reception on the top table, the centre of the buffet table or on a separate smaller table or trolley. At a sit-down wedding dinner the cake should be cut just before the dessert is served. At a buffet the cake should be cut nearer the end of the reception celebration. The custom is for the bride to hold the cake knife while the groom places his hand over hers. Together they cut the first slice and place it on a small plate. Using a small desert fork the groom feeds the bride the first bite and she then feeds him the second which symbolises their commitment to share with and support one another. The cake can then be cut into portions for each guest to take away or the cake may be served as a dessert. Just don’t forget to save a piece of wedding cake for any guests who were unable to attend on the day!